Kids listening to a guided reflection in religion class. 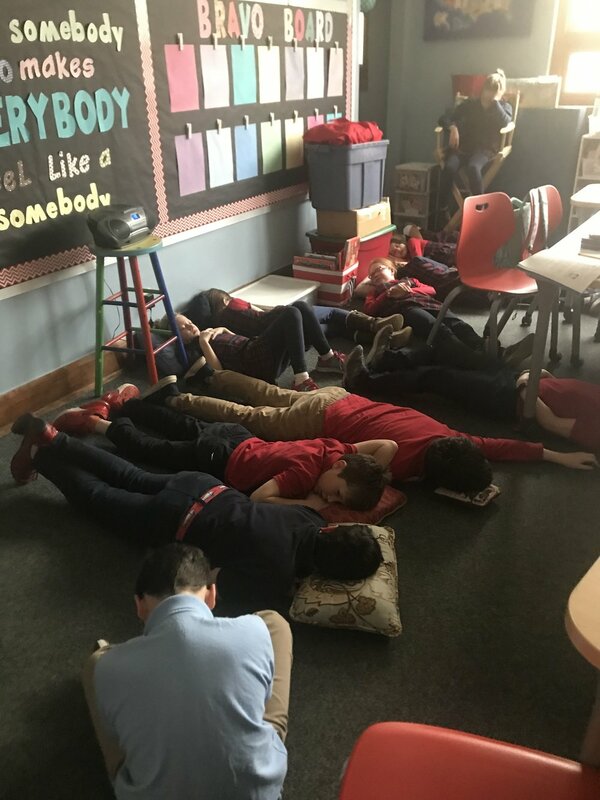 Last week students’ read a Journey’s text, The Earth Awakens, a historical fiction story about the devastating Earthquake that shook San Francisco, California, in April 1906. They practiced sequence of events, (an important comprehension skill), and visualizing as we read. This week we begin our new novel The Witches, by Roald Dahl. We will start the week examining literary elements and the difference between protagonist and antagonist characters. We will also evaluate various themes in this book. We start this week on electrical dissection. If you have any old appliances or old computers we would love to take them apart.. The students are becoming experts on the Northeast Region of the US. They are working on knowing the abbreviations and the locations for all 11 states. They also drew a mental map of the region. Each student put their creative energies to use by making a creature with the shapes of the 11 states of the Northeast. Daily Geography focused on the Appalachian Trail. This week we will continue to work with the Northeast region. My plan is to give the quiz for this region on Thursday, 1/17. Daily Geography this week will also focus on the Northeast Region. We have finished the unit regarding the introduction of long division. Next up is long division with decimals. We will start by evaluating decimals in the dividend and then move to decimals in the divisor. Vocabulary: We will begin unit 9 this week, test next week. Writing: Students finished persuasive paragraphs following the Christmas theme. We will begin this week, writing and researching saints for saint reports. Having completed our focus on Christmas and Epiphany, We are now back to unit 3 in our religion books, lesson 11 The People of God, learning more about our Church community and what it means to be a disciple. We will then move into lesson 12: The Church Teaches Us, Jesus calling the Church to continue his mission.